I have been using the Sony Xperia Z3 for a little over a month now. (You can read my initial review of it here.) The Xperia Z3 is a great phone! I still love the size and brilliance of the screen. What makes using any phone even better is your the ability to get the most out of it – its features and hidden gems they you may not even be aware of. 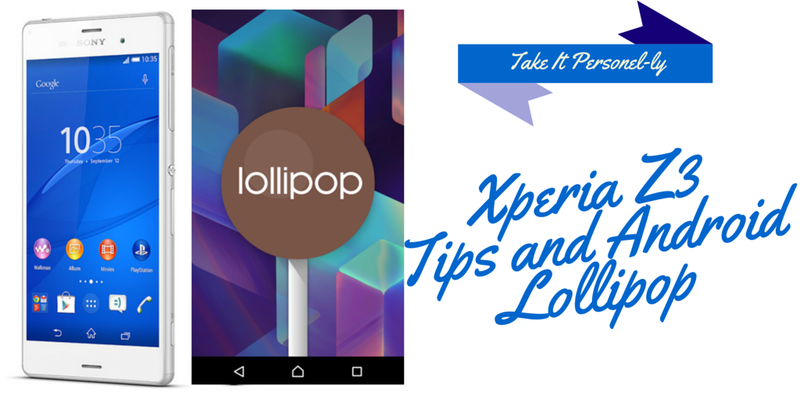 I will share with you some of my favorite Z3 tips and tricks to get the most out of using the Xperia and also share some new features of the Android Lollipop 5.0 OS update. This is always one of the first things that I do when I get a new phone. I go through and re-arrange icons, look for widgets and themes, and play with the look and feel of the phone. By personalizing your phone, and adapting the layout of it to maximize productivity, it really transforms your phone, and in my case – the Xperia Z3, into a personal assistant. Sony provides some beautiful themes which are featured in the Xperia Lounge app. The Play store has many more others to chose from. Themes can infuse some personality and character into your phone. Right now I have an X-Files wall paper on my Z3 sleep screen, as I am looking forward to the new episodes now slated for release early next year. 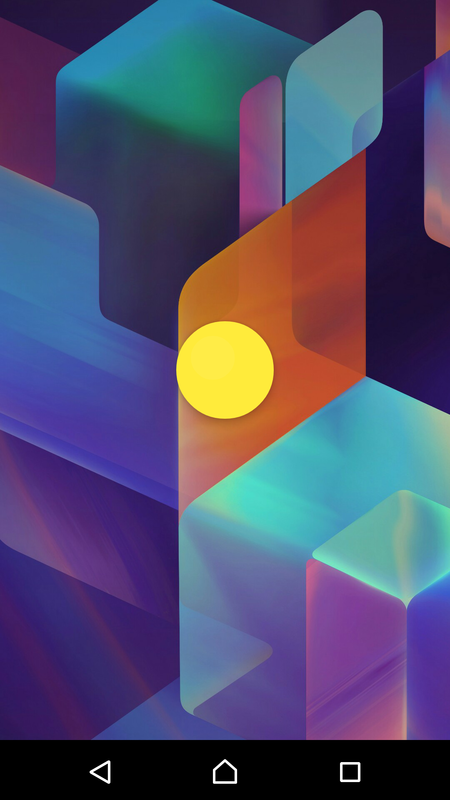 With the upgrade to Android Lollipop 5.0, all you have to do is hold your finger on the screen for a couple of seconds and the options pop up at the bottom of the screen for selecting wallpapers and widgets. 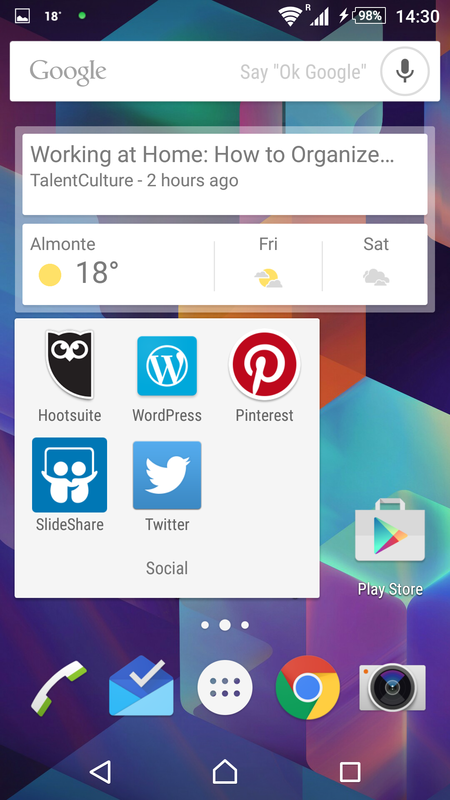 With the recent upgrade to Android Lollipop, the use of Google Now cards is a prominent feature of Google’s new OS. 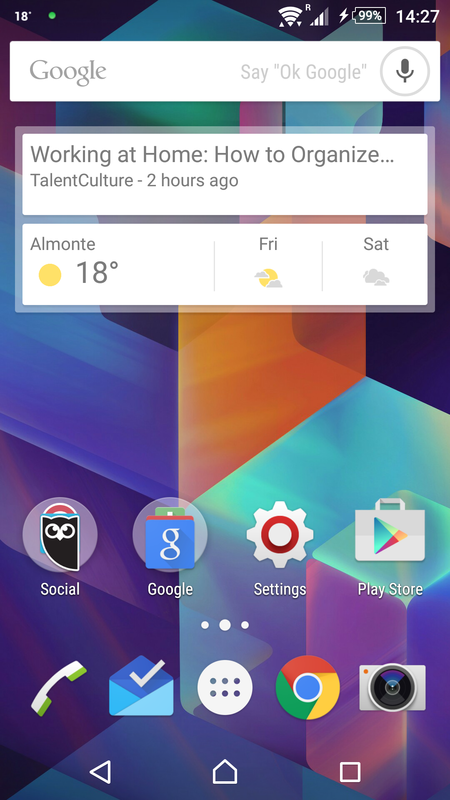 I placed the Google Now Launcher widget on my home screen. I get updates in the morning and afternoon on traffic, and how long it will take me to get to work and home. I have weather information handy plus I also get updates from the blogs I frequent the most and frequent Google searches that I do on my other Google devices (provided that you are logged into the same Google account on other devices when performing searches). I love organizing the icons that I use the most into folders. If you press down and hold an app icon on any screen for a second you can move it around. By placing the icon on top of another you create a folder. As you can see from my screen shot above, I have a “Social” folder which I use to put the social media apps that I use the most. Below is an expanded view of the folder. One amazing feature on the Z3 is the built in ability to take screen shots and screen videos. By holding down the power button a menu pops up providing options to power off, restart, take screenshot and record the screen. I used the screenshot feature for all of the photos in this post. No need for other apps. The Sony screenshots are very crisp and clear. 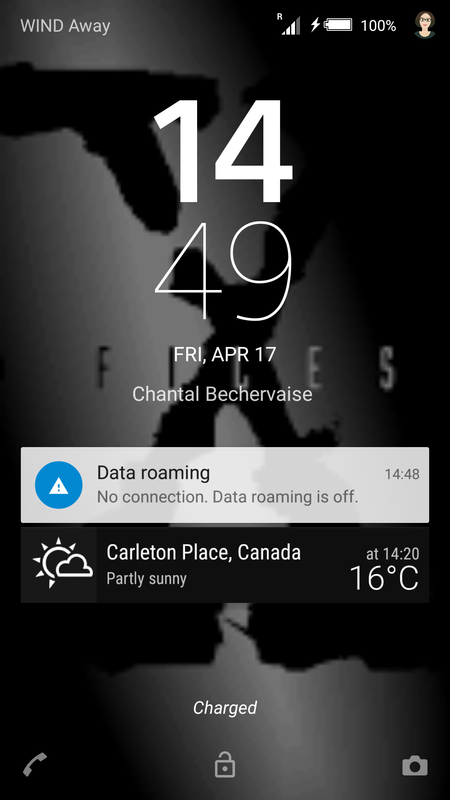 Another tip for personalizing your Z3 is managing the notifications in the notification (status) bar. 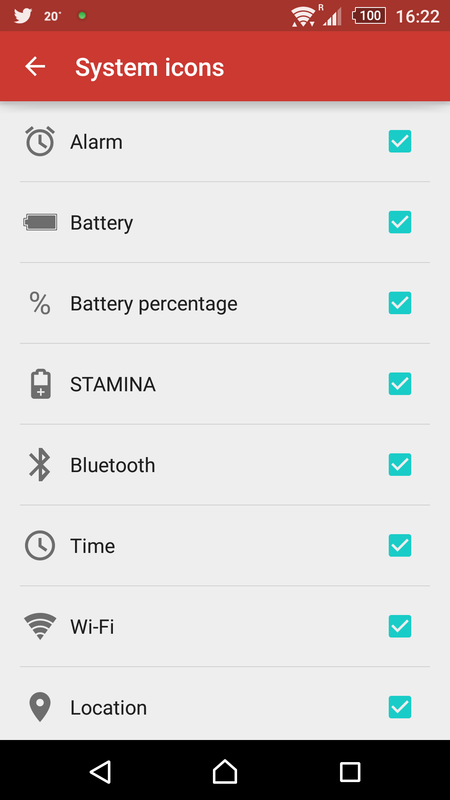 By going to Settings -> Personalization -> Status bar icons, you can select which system icons appear in the notification bar. The new upgrade to Lollipop also allows you to change and rearrange quick settings by tapping the notifications bar and then tapping the edit icon. 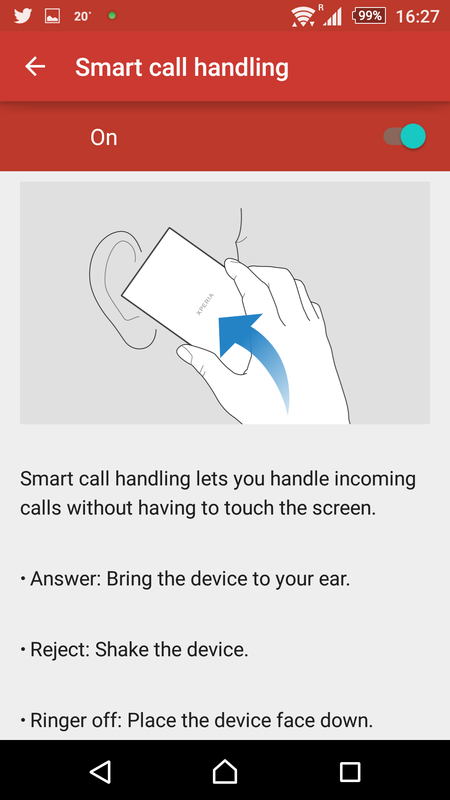 This is another favorite feature of mine on the Xperia Z3 – I can enable smart call handling which makes answering calls easier and quicker. Be enabling this feature I can handle calls on my Z3 without touching the screen. To answer the phone I simply have to bring the device to my ear. To reject a call, I shake the device. And if I do not want to be interrupted in a meeting or while working, I place the device face down and it will turn the ringer off while it is face down. 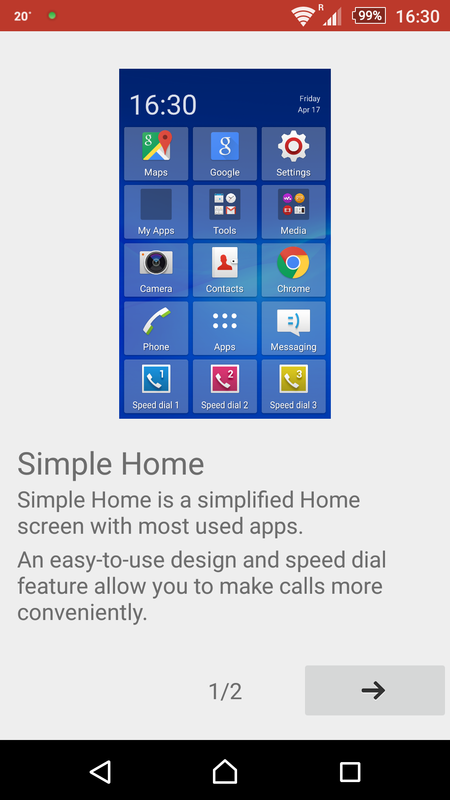 There are different types of home screens that you can set up on the Z3. 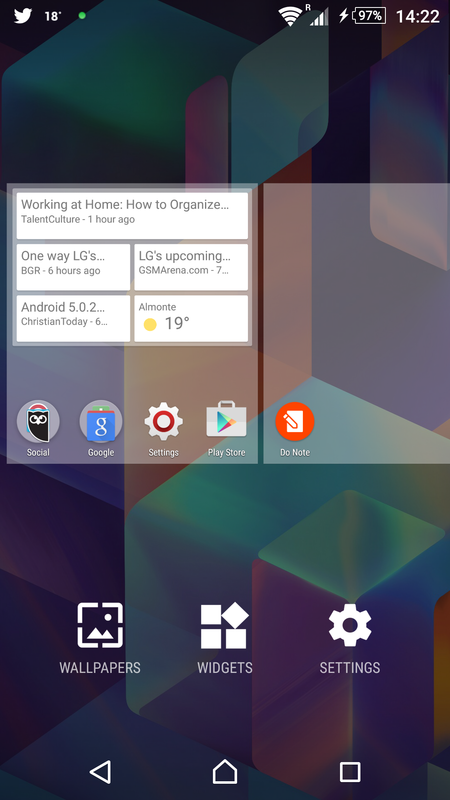 I use the Google Now Launcher for mine, but you can also use a simplified Home Screen called Simple Home. It is found under the Settings -> Home -> Simple Home. It will show the most used apps on the home screen and gives you the option to enlarge the text as well. 5) The Xperia Z3 has its own, built in answering machine. After recording at least one greeting (you can record multiple ones and switch between them as needed), the answering machine can be turned on. You can also adjust the settings for it to pick up after a certain amount of seconds. This is a great feature as you can save your voice mail messages to your SDcard and save additional charges from your cell service provider if voicemail is not included as a standard option. 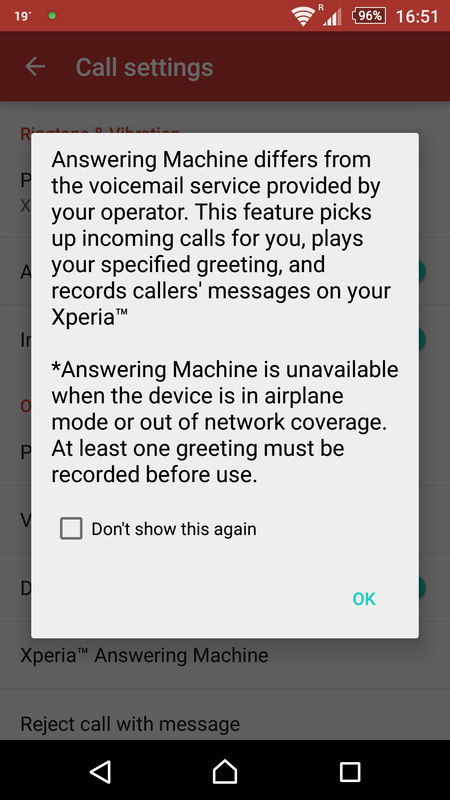 Even if it is an included option, you may prefer the flexibility of the Xperia Z3 answering machine as you can record multiple greetings, save them, then switch between them. For instance, you can record a message for when you are in meetings, evenings, weekends, vacations, etc and switching between them takes only a few seconds. With an SDcard you can also save a lot of messages, for as long as you want. 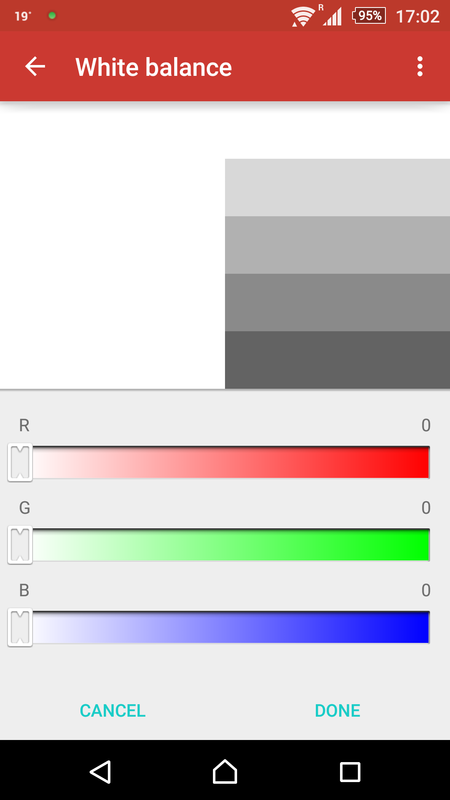 I know that I a lot people do not like the preset white balance on their phone screens. Sony has an easy way to change it. ***Bonus feature: No more cold fingers in winter while using your Z3! You can go into the display settings and select glove mode which will enable you to use your Z3 with gloves on. I have already been using the Android Lollipop 5.0 on my Google Nexus 9 tablet. 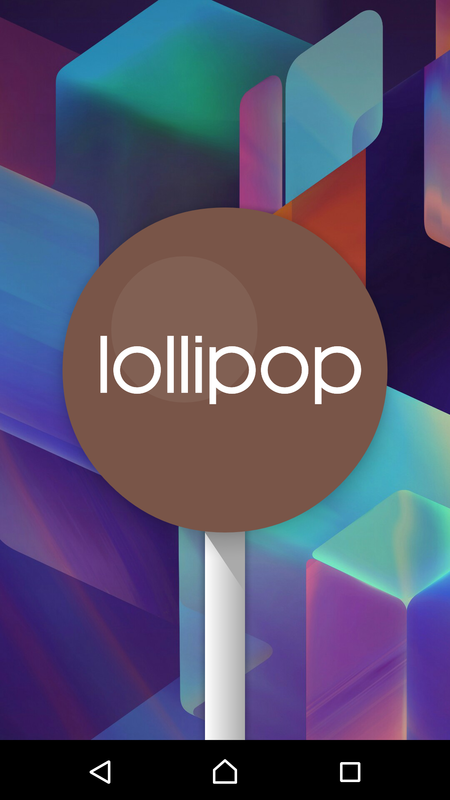 I love Lollipop! I was recently prompted and installed the 5.02 version on my Z3 and it works beautifully. Android Lollipop includes Google’s new Material Design with lockscreen tweaks, new notifications and many more enhancements, and the update for the Xperia Z3 also includes some manufacturer-specific additions. From the lock screen notifications to how calendar appointments / events are displayed, the Material Design is becoming the new way to interact with Android. From a productivity perspective, I find it to be very helpful, as it will automatically update appointments that I have made from my Google Inbox into my calendar and will set up the notification cards so that I don’t forget about them. For example, I made travel arrangements for a conference and when I received the email confirmation, it updated my calendar with all the pertinent information. 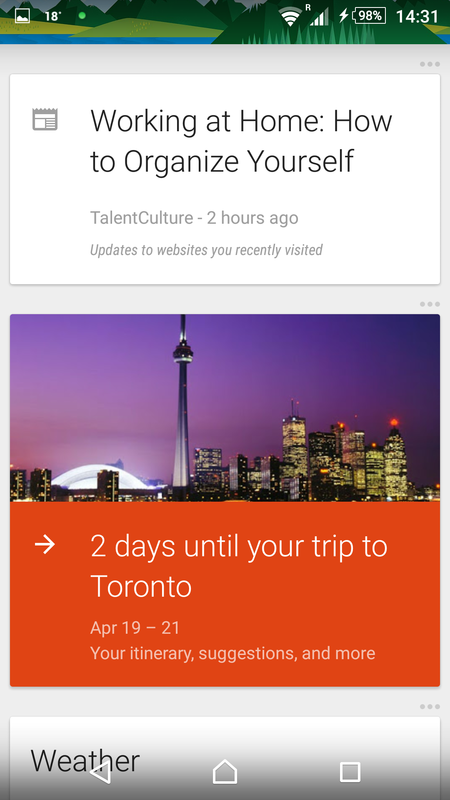 It also reminds me of upcoming travel in the Google Now cards section. 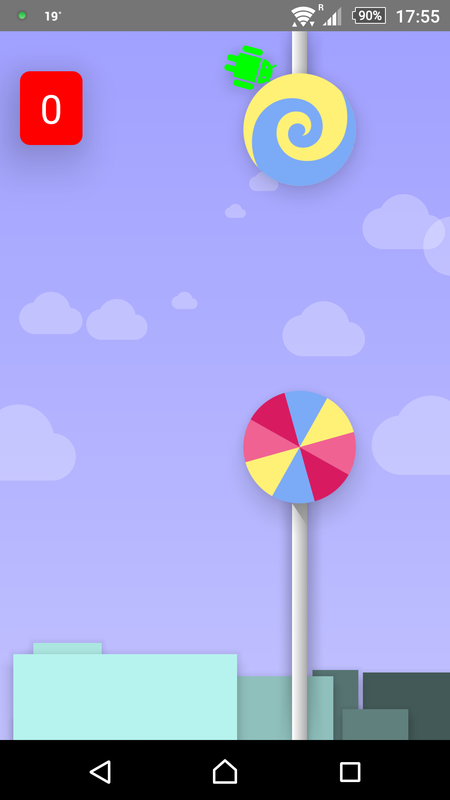 The Lollipop upgrade has also provided me with the ability to set up guest accounts on my phone. This is great for parents of even business travel if you are letting others use your phone. You can monitor and change the settings on the guest accounts. Go to Settings -> About Phone and scroll down to your Android Version. After tapping the logo a few times, press and hold it and the hidden game appears. Stayed tuned for my next Xperia Z3 post, as I will take all the tips and tricks and my experience using the phone and show you how it all can be integrated to improve work / life balance and flow. I received an Xperia Z3 from Sony for use in putting together my post. Good or bad, my reviews and opinions are honest with my readers best interest in mind.